Many fans of low-budget films will agree: often the charm of “B” classics is their poor production values and lousy acting, somehow making the films more endearing than they would be otherwise. But every once in a while, a true gem comes alonga low-budget sci-fi thriller with a somewhat outlandish plot made plausible, even compelling, by a strong script, powerful direction, and the strength of the characters and the actors who portray them. Unearthly Stranger is one such film. A group of British scientists are working on a new and innovative method of space travelpsychic projection. Using the power of the brain, specifically a part of the brain known as TP91, the traveler, by sheer force of will, is able to project his or her mind through space and take physical form upon arrival. Just as one of their scientists, Professor Geoffrey Munro (Warren Mitchell), makes a major breakthrough, he is found dead in his office, a victim of some tremendous electrical force that causes his brain, quite literally, to explode. Dr. Mark Davidson (John Neville) is called back from his vacation in Switzerland to replace the late Professor Munro, and brings with him a new wife, Julie (Gabriella Lucidi), whom he met while he was away. Viewers might recognize John Neville as the “Well-Manicured Man” from The X-Files movie (1998). Major Clark (Patrick Newell), a rather corpulent, grating bureaucrat, reveals to the scientist in charge that Munros death is not an isolated incident. Other national research teams, including the U.S. and the Soviet Union, have had similar mysterious fatalities, and the cause has yet to be identified. Davidson and his foreign-born wife immediately come under suspicion. Davidson is at first angry at being suspected of foul play, but his anger soon turns to doubt as he begins to notice unusual and inexplicable things about his new bride. One night, returning home late from work, he is frightened when he finds his wife sprawled across the bed, her eyes wide open. Fearing for the worst, he reaches for her wrist to check for a pulse, only to find she has none. She then wakes, greeting her husband with all of the love and enthusiasm of a newlywed. Other circumstances lead Davidson to confide in his boss, Professor John Lancaster (Philip Stone), who then witnesses Julies strange abilities first hand as she pulls a casserole out of a 350 degree oven barehanded without burning herself. Julies own confidence is also being worn down by her feelings of alienation. When she discovers the local children are frightened by her sheer presence, streams of tears start rolling down her face, burning her skin like acid. Just as Davidson and Lancaster agree to test their suspicions, Julie confides in Mark. She is indeed an alien, sent to Earth to prevent this planets scientists from succeeding in their efforts to travel to the furthest reaches of the universe. But she has failed in her mission: she has fallen in love with Mark and with her life on this planet. Now they must face the consequences together. Its difficult to say that any one element makes this movie work. Incredibly strong and believable performances by Lucidi, Neville, Newell and Davidson make suspending disbelief much easier than it would have been if the cast had been more wooden, as is often the case with ‘50s and ‘60s “B” movies. The story, as implausible as disembodied space travel might seem, is made plausible by confident delivery and skilled execution. Its difficult to know how much credit to give to writer Rex Carlton, whose other writing credits include such memorable titles as Blood of Draculas Castle and The Brain that Wouldnt Die. 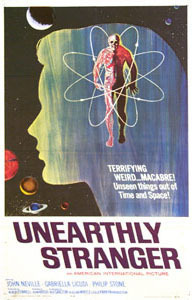 Unearthly Stranger also features a moody and atmospheric score by Edward Williams. Williams spent several years (1950-1970) composing scores for the British Transport Film Unit. His score for Unearthly Stranger moves the action along, from the striking first sequence, which sets the anxious tone for the rest of the film, to the soft, crooning melodies that convey Davidsons love for his wife, Julie. Although Williams no longer composes film scores, he continues to be one to the most innovative electronic music composers alive today. The editing is top-notch, a fine first effort by film editor Reginald Wyer (here credited as Reg). But perhaps most notable of all is director John Krishs contribution to the look and feel of the film. John Krish is most well known for his work on the hit television series, The Avengers. The elegance and style of the television show is also evident in Unearthly Stranger. It is unlikely that Unearthly Stranger will be appearing on video or DVD. MGM recently let the copyright on the film go, and currently there are no plans for the films copyright to be picked up by any other company. A pity, considering that Unearthly Stranger is one of the more refreshing films Ive seen of late, holding its own against one of my favorite films, The Haunting, which, incidentally, was made the same year and shares many of the same cinematic qualities. The storyline, however, is classic Cold War. Like Invaders from Mars, the enemy is well-camouflaged and is closer than you think. The ending provides a nice little twist, one that I would usually discuss in more detail, but is one of treats this film has to offer. Unearthly Stranger is a surprising little film, coming in at just over 76 minutes, and definitely worth the time if you should ever have the opportunity to see it.